These are the 2018 Events YOU missed! Welcome to our 22nd Camping Season! Our 2018 Camping Season officially Opens! Stop in and say HI and join us for hot coco & cookies. Who will get the 1st Throphy of the year? Seasonal Campers are encouraged, all are welcome! Time to rest and relax this weekend camping. Paw Print Contest begins.... Happy Hunting!! Join us Saturday evening for a "FONDUE PARTY" & Penny Bingo. Who is going to find them this year? Pick up your list and start the search! Receive a card for each item you find. The best "poker Hand" wins the Grand Prize. Come spin the "Wheel".... 1 spin per campsite. Then join us for a "Wheel of Fortune"® Game Show Tourney. Who is going to take home this years Trophy? 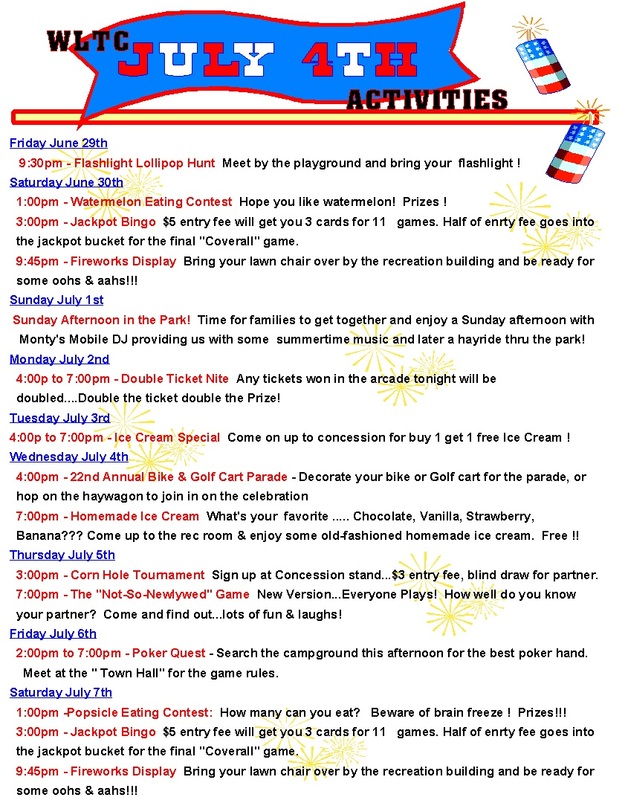 June 29 thru July 7 Fourth of July's 9 day Week ! Can you accomplish the challenge in these skillful games? Give it a try, you might just be the Grand Prize winner! Stop by the WLTC Malt Shop and enjoy an old fashioned burger and malt made with Lafayette's "Original Frozen Custard"($) this weekend, then get ready to Twist the night away at the Sock Hop. Calling All BINGO lovers This is YOUR weekend!! !Chocolate Bingo, Camping Fun Bingo, & our 11th Annual BINGO TOURNAMENT! Don't forget to stop by and try our "Taco Bar." ($) They're Yummy ! Kids games, Bingo, Corn hole Tournament, Biscuits & Gravy Breakfast ($), Disco Fever Dance Party"
Who will be this years "King & Queen" of Disco? 21-22 Tailgaters Weekend: Beer Brats ($) available all weekend at the concession stand. Come watch college football on the big screen & join us for a Table Top Football Tournament. Time for falling leaves, watching football, and a Soup & Sandwich Potluck dinner followed by "Trivia Contest" ---Last Trophy of the Year! Get ready for a Howling Good Weekend! !